Clark is both elated and confused by his son's return and Lois is equally stunned to find a seventeen year old in place of their little boy. This isn't the first time the Kents have dealt with the world of the bizarre and weird but Jon has a lot of explaining to do. Beginning with the departure of Jon, Lois and Jor-El and their arrival onto a gigantic Kryptonian ship. With Lois now wearing a Superwoman suit much like her counterpart did when she and Lana shared the mantle, they head to an intergalactic trading post. Lois is surprised how revered she is just for wearing the crest of the House of El as Jor explains Superman's exploits have made them galactic royalty. The trio also attract the attention of Lobo who has a few choice words to share with Jon before disappearing into the approaching crowd. It seems Superman's reputation also attracts people who want something from the El's. Lois experiences something Clark did when he saved the space shuttle years ago. Jon reveals that as his mother left Jor began to change and that's why he has spent seven years trying to get back to Earth. Clark is still perplexed as Jon's tale showed nothing but his enjoyment at being with his grandfather. Jon turns to his parents and explains that he's discovered Jor-El is insane. Story - 4: So we finally find out what happened to Jon and Lois after the Man of Steel miniseries. It's good to finally fill in the gaps because we've been through a bit of a slog to get here. Were there any revelations? Not really. We knew Jon wanted to experience his powers without restrictions. We knew Lois came back after a traumatic experience (it was nice to see a moment mirrored by Clark's debut). We also knew from the very beginning of 'The Oz Effect' that Jor-El was not well psychologically. So as I said, nothing has happened that we didn't already suspect had transpired. There were two scenes that stood out. One was the nod to Phil Jimenez and his phenomenal work on Superwoman and the other was Lobo's poignant conversation with Jon. I'm a little apprehensive of Jon's age jump. It still seems unnecessary, especially as we've known Jor was unwell for a very long time. 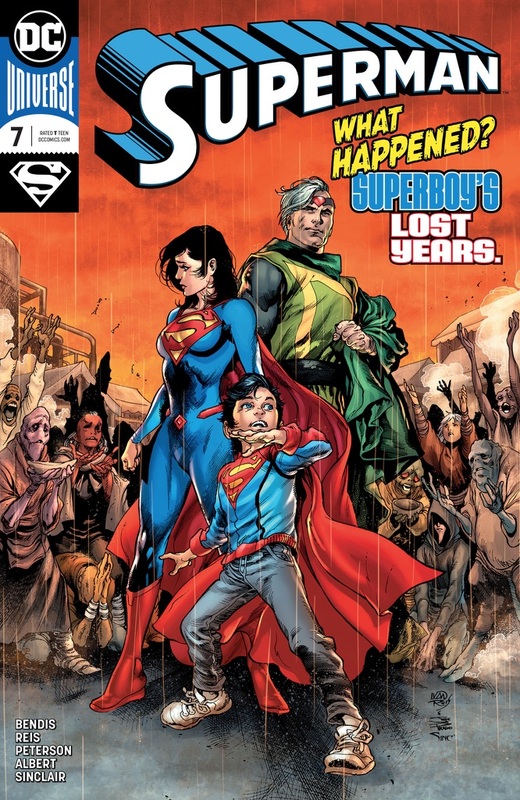 This 'lost years' chapter which took place over a one week period, given the time passed in the books with Lois' return to Earth. This issue didn't do enough to explain it away. The Supergirl TV series did a better, more plausible, explanation in its opening monologue. The scenes where Clark and Lois run through all the possibilities for the age jump were pure gold and I'd love to see more of that. The character moments were something sorely missed from this series and I'm glad we will get to see more of that. Art - 4: The art suffered from the bouncing between the creatives. The best example I have is Jon's physical size and his scar across his face. The consistency across the book is the main issue for me as individually, each section is really well illustrated. I don't think I've ever come across a book where the art chores 'too many cooks' wasn't a problem. Although I liked seeing Lois in her Superwoman costume again I'm not so impressed with the angles while she was in it. Cover Art - 4: I liked this cover as it does a fantastic job of conveying the emotional beats for each character this issue. The color palette gives a nice energy to the whole piece. Always good to see a cover depicting a real scene from the book. Variant Cover Art - 3: Angry and moody Superman always seems to pop up on the covers. A little weird to see as the interior of the book is all about Clark being unbelievably happy. 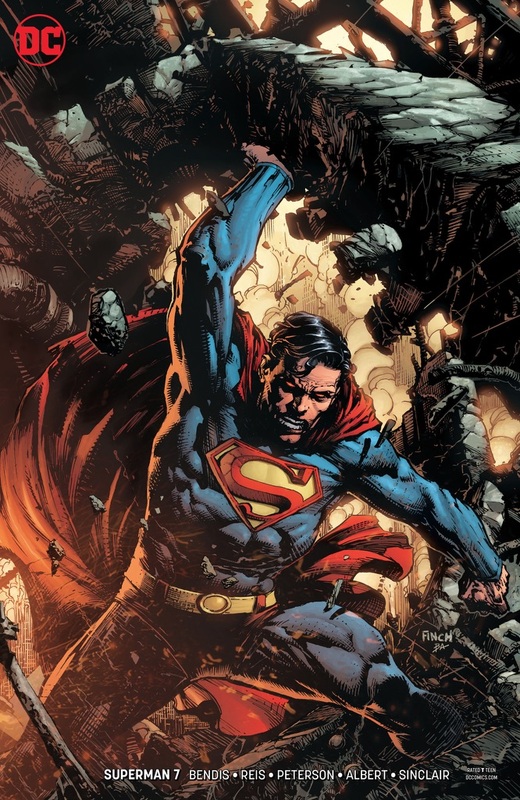 I really like the art of David Finch so it's great to see his version of Superman in action wish it wasn't so dark.